North Queensland has a few things going for it. It’s the land of majestic rainforests, breathtaking coral reef systems… and more dangerous animals that can potentially kill than in an episode of ‘Survivor – Champions vs Contenders’. What could possibly go wrong? Merely mention ‘I’m going to Cairns for holiday’ and most people are inclined to tell tales of wild beasts (‘the cane toad was THIS BIG!’) or enchanting anecdotes of luxury and adventure (‘my Pina Colada was THIS BIG!’). And why wouldn’t they? This is a destination that attracts as many rockstars and celebrities as Cannes (it’s easy to get the two confused…). Luther Vandross and Janet Jackson were onto something with their catchy tune, and we here in the tropics believe everyone should experience this pocket of nature to discover priceless gems. Here’s a local’s guide to 24 hours in tropical paradise without breaking the bank. Rainbow coloured sunrise? Check. Sweeping panoramic views of rainforest meeting reef? Yup. Perfect way to start the day? Got it in spades. Greet the day with sunrise at the Cairns Lagoon – a large saltwater infinity pool that hugs the coastline of the Cairns CBD. The Esplanade is a magnet for all visitors from around the world as a sunbaking and social mecca, so soak up some rays, enjoy some safe swimming, or for the fit and fabulous enjoy the number of free fitness classes put on by the Council every day. From pilates to Aqua Zumba and beach volleyball with almost everything in between, there’s something for all fitness levels. As the Giant Prawn is to Ballina, Rusty’s Markets is Cairns to a tee. Smack bang in the centre of town, these hawker-style markets operate every Friday – Sunday and are renowned for exotic produce (dragonfruit and purple mangosteens, anyone?) and over a hundred vibrant stalls with everything from flowers and cheese, coffee and chocolate, breads and local charcuterie as well as clothes and trinkets. On a fine, sunny day approximately 12,000 years ago something rather dramatic happened on the Atherton Tablelands involving magma and earth plates and volcanic eruptions and other things very geo-exciting, resulting in a pretty epic swimming hole. 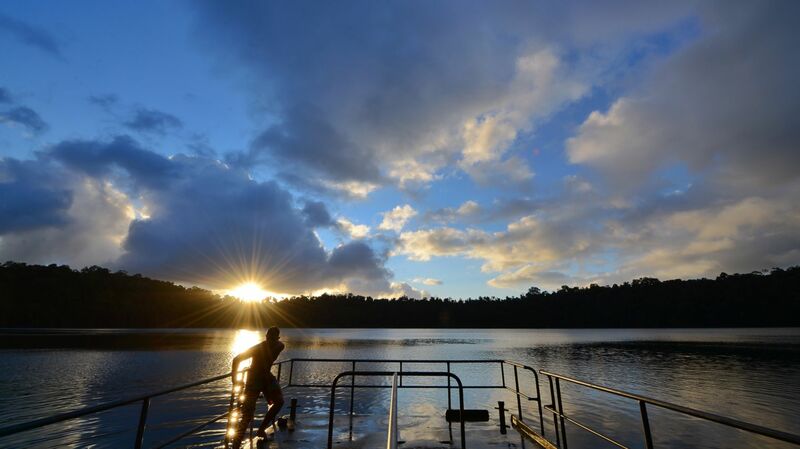 At an impressive 65m deep, Lake Eacham is a volcanically formed crater lake surrounded by beautiful rainforest and home to many freshwater turtles and fish. The water is a comfortable 23 degrees Celsius all year round, making this a perfect spot to hang for an afternoon. BYO picnic and BBQ spots also available. Budding botanists – this one’s for you! As you might have noticed, it’s quite green up this way, with an abundance of palms, gingers, orchids, bamboos and vines, as well as exotic fruit trees like soursop and jackfruit covering a decent 38 hectares. Check out some of the rarest plants on the planet including the world’s largest flower, the Amorphophallus Titanum which is up to 3 meters tall, with leaves up to 7 meters across and weighing in at over 70kg. Also known as the ‘corpse flower’, she’s a bit whiffy (!) but still magnificent. Dine under the stars on a star… the Prawn Star, that is! Tropical dining to absolute perfection: clamber aboard this for reals fishing trawler and fill yourself with prawns, mud crabs, oysters and whatever else was caught that day at almost wholesale rates, while taking in an equally delicious sunset from Cairns Harbour. Moored at Marlin Marina (just a short walk from the Esplanade), this is Cairns living at its best. Have you been to Cairns lately? What were your favourite free things?